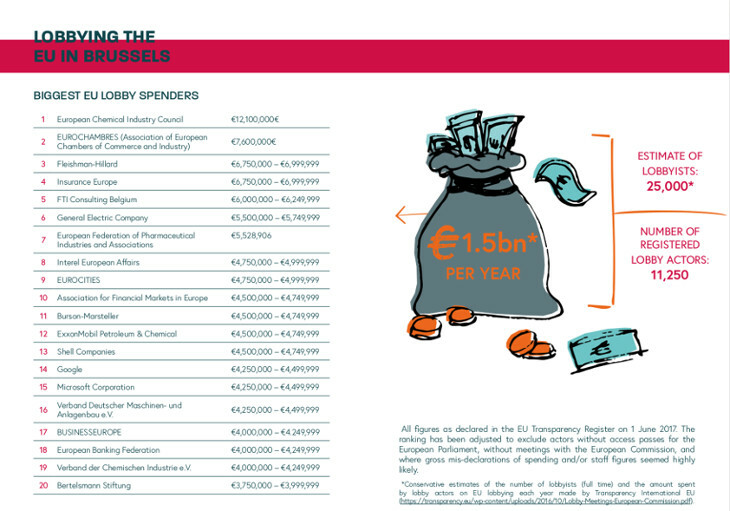 Lobby Planet, our new guide to corporate lobbying in Brussels, is out now! ... et ce petit guide des lobbies est aussi disponible en francais! There are an estimated 25,000 lobbyists working in Brussels; most of whom are representing the interests of corporations and their lobby groups. Lobby Planet takes you on a tour of the EU Quarter to explain the many – and often shady – methods of corporate lobbying used to influence decision making in the European Union. Lobby Planet traces the invisible lines of political power that criss cross the city to give you an idea of how lobbyists work, who the biggest players are, where they meet, and what issues they focus on. It has over 135 entries of groups representing different industries’ interests including agribusiness, finance, digital, big energy, tobacco and proponents of free trade. As well as a geographical and thematic guide to corporate lobbying, it provides you with a jargon-busting dictionary so you can decipher what the EU’s economic and political elites are talking about. It ends with suggestions of what you can do to challenge the corporate capture of democracy. Corporate lobbying tends to thrive in the absence of public scrutiny. So the more of us who are watching, getting informed and taking action, the better! If you're looking to resarch the world of corporate lobbying, we have put together a list of free online tools that can help. The previous edition of CEO’s Lobby Planet guide was published in 2011, while the very first edition dates back to 2004.